A delightful small cupboard for kitchen storage, the Amish Pine Pie Safe comes home wearing your favorite finish. This pine furniture is cute and cozy for kitchen, hallway, bathroom, or anywhere you're looking to add a small storage cabinet. It features one small drawer and opens to two solid pine shelves. This Amish Pine Pie Safe is part of the Heritage Pine Collection that's built by hand at an Amish wood shop in Pennsylvania. Made with pine wood means you can connect with lots of color options when it comes to the finish. Samples are available for you to consider as pine wears stain, paint and distressing very well! At DutchCrafters, we offer a wide variety of pie safe styles with numerous custom options you can consider to create the look you want. 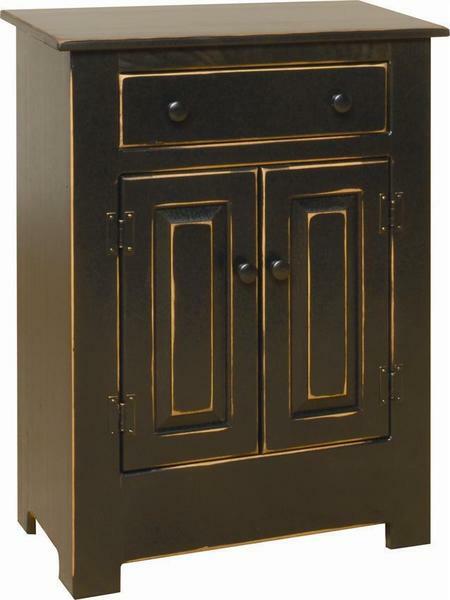 Our collection includes pie safes with one door, two doors, copper doors or tin doors. Select options online or contact us via email or phone. Thank you for shopping with us.